One bite and you're transported to Louisiana! One bite and you're transported to Louisiana! Shrimp cooks quickly, and overcooked shrimp quickly becomes tough and rubbery. Cook the shrimp just until the tails curl and the flesh is opaque. No time to cook brown rice? Serve this dish with whole-wheat pasta! Saute the onions in a large pan set over medium heat for 2 minutes. Add the garlic and celery, cook another two minutes, then add the peppers, spices and tomato paste to the pan, stirring as the mixture cooks another two minutes. Slowly add the tomato sauce and stock to the saucepan and stir to combine. Bring the mixture to a boil, then reduce to a simmer for 10 minutes. Add the shrimp and simmer for two minutes. Serve over brown rice (nutrition info included). 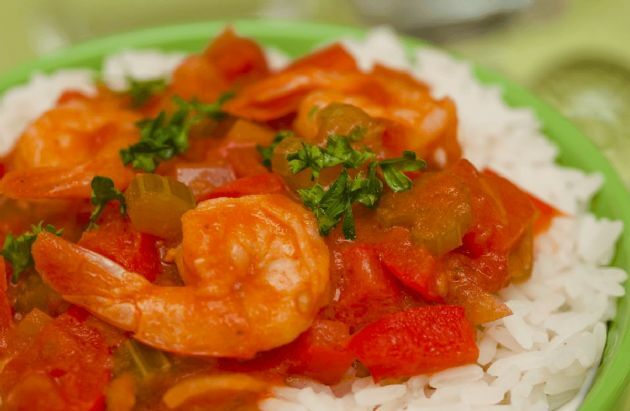 Serves 4 (1 1/4 cups of shrimp Creole and 1/2 cup rice). This recipe has Attitude! My DW is nearly a shrimpoholic and we both like a bit of spicy, this satisfies it all Shrimp & veggies combine with the spices to give the recipe that Master Chef touch. A GIANT Thank You, Chef Meg! This deserves a Six rating.